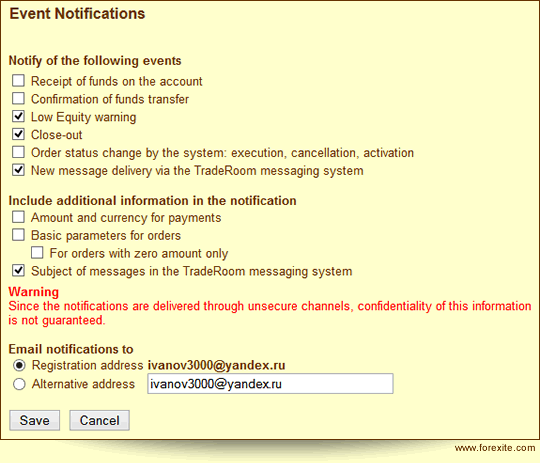 There are the tools to place, edit and cancel the orders as well as to trace their status and changes in them, in TradeRoom. The orders can be placed at any distance from the current market rate, even up to one point. You can place the orders for any amount: the same rules as for trading amounts are applied here. Besides, you can place orders with a zero amount (more detailed information on this unique possibility will be provided hereafter). You can place OCO orders (linked orders) as well as If-Done orders (they are activated after the parent order has been executed). You can also specify the type of the trade you need, a Forex one or that of conversion, in the order. It is possible to enable trailing in any Stop order. There is an opportunity to limit the order validity as well. After a Forex trade is executed, the TradeRoom may offer you to place orders for an automatic close of an open position (or a deal if you have chosen the "Advanced" trading style). It happens in case you have the "Offer order operations" option enabled in your trading preferences. E.g., you have opened a position by selling 200 000 EUR. A form with the parameters to place two new orders appear at the bottom of the page. The rate values proposed for the orders by the system are calculated according to the settings specified on the "Order Preferences" page. The distance in the points from the reference rate, in this case it is the Forex trade rate, to the appropriate rate is set in the "Order Preferences". The order rate value is computed by adding the set number of points to the trade rate. The system proposes a placement of two linked (OCO) orders, Stop and Limit, for the open position. The orders are linked with each other, which means the automatic cancellation of one order when the other is executed. A Stop-order is used for the limitation of a possible loss when the market rate moves in an undesirable direction, whereas a Limit-order is for the fixation of profit when the direction is desirable. The Stop-order can be placed with Trailing enabled, for that option you should mark the column "Trailing" as it is shown on the previous picture. The trailing means that in case the market rate moves away from the order, the order rate automatically shifts following the market one. If the market rate moves towards the order, the order rate does not change. When the "Trailing" option is enabled, the distance of trailing is calculated as the distance between the specified Stop-order rate and the current rate at the moment of the order operation, and the trailing step is set to minimum. It is possible to change these values at the order editing. 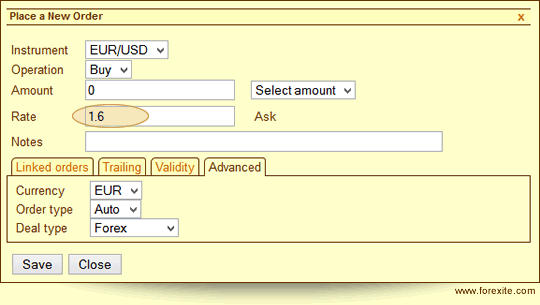 Forex trade orders are placed after you press the "Place" button. The rates of the placed orders are shown in the columns "Stop" and "Limit" in the "Open Positions" tab. Let's say you have chosen not to place orders after making a Forex deal. You can promptly place orders for an open position or a deal right in the "Open Positions" tab. To do this, just click in either of the columns, "Stop" or "Limit". This opens a context menu where you should select the "Create order" command. 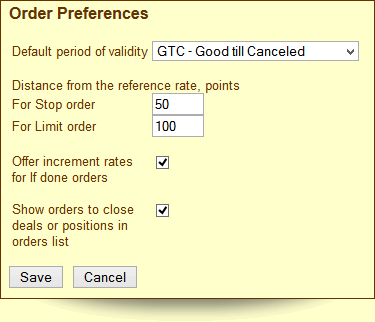 A form to place Stop and Limit orders to close the open position (or the deal) will be displayed. In this form, you can specify order rates, enable trailing as well as disable the placement of unnecessary orders. The orders will be placed after you clicking on the "OK" button. This form allows not only placing new orders, but also editing the rates of the orders placed before as well canceling the orders. It is possible to edit, cancel or add new orders on the "Orders" tab. Please pay your attention that this tab displays the active orders only. If you want to see the executed or cancelled orders, go to the "Orders List" report which can be found in the "Reports" section. To change the order rate, click on its value in the "Rate" column. A small edit box, where you can set a new order rate, opens. In case you need to change the order more essentially, just click on its line. Then the order edit box will be displayed. In the editing window, you can edit the order as you want. 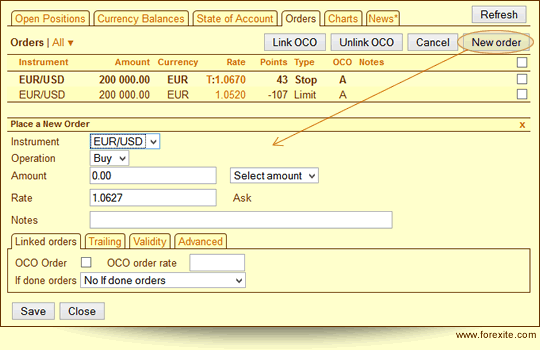 You can edit the instrument, operation, amount, currency, rate, order type and type of deal (trade); add an OCO order as well as If-Done orders; activate trailing and set its parameters; limit the order validity; write your own comment to the order. If you modified the order many times, then you might want to look at the history of its changes in the "Change log" tab. Editing orders which close a deal, or a position, is limited: you will not be able to change the instrument, the operation, and the amount. The changes will be applied after you press the "Save" button. To place a new order, click on the "New order" button on the "Orders" tab. Set the necessary parameters in the window (very much like that for editing) for a new order placement opened. Open position optionality for order placement. Possibility to place If-Done and OCO-orders. Possibility to set the order rate as an increment. Possibility to place the orders at any distance from the market rate. Possibility to place zero orders. Position-independent trailing-stop with a possibility of a position opening. Let us take a detailed look at the peculiarities. In TradeRoom, the orders being placed do not depend on the open positions. That is an important feature of TradeRoom and, as a result, you can use orders to open a new position. 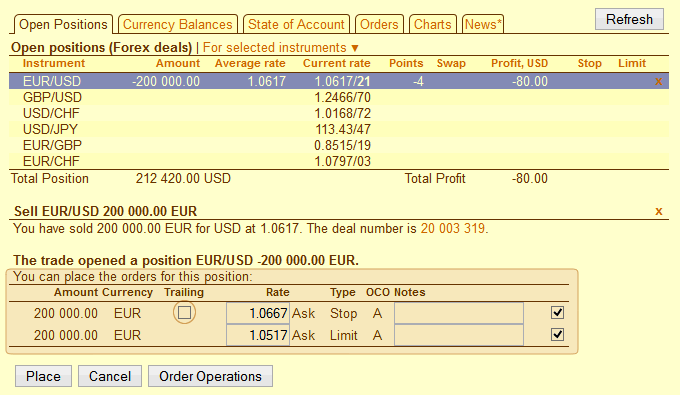 The picture above shows a placement of an order, which opens a position for the EUR/USD instrument, and two linked if-Done orders are being linked with it. After the parent order (the parameters of which are set at the top of the form) is executed, the two OCO orders (the parameters of which are set at the bottom part of the form) functioning in this case as Stop and Limit, will become active. If one of the two OCO-orders is executed, the other one will be automatically cancelled. To unlink these orders, first select them: tick a mark near them (in the last column after "Notes"). Then click the "Unlink OCO" button. As a result, the OCO group letter marking will disappear from the "ОСО" column of the selected orders. It means that the orders are unlinked from each other. The TradeRoom system allows setting the rate as an increment to the reference rate instead of the exact execution rate for any order. The figure above shows the rates of the Stop and the Limit orders set as increments, whereas the rate of the parent one is specified explicitly. The increment is put as a formula starting with "=". The "+" and "–" signs specify the direction of the increment. E.g., the "=+100" entry means, the order rate at the activation moment will be 100 points more than the reference rate, whereas the "=-50" means the order rate will be 50 points less than that of reference. 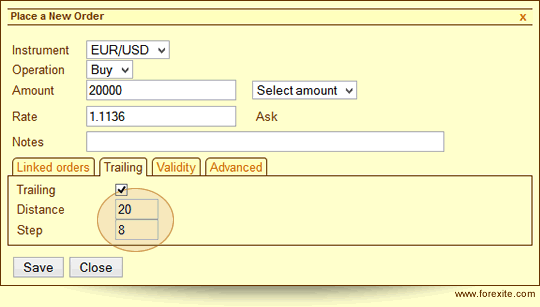 You can set the rate as an increment for any order, active or pending. If the order is active the current rate is taken as a reference rate at the order activation. For the pending order (If-Done), the current rate is taken as the reference rate when the order is activated (it is usually the parent order execution rate). It is always recommended to set the order rate as increments for the If-Done orders. In this case, the position of these orders relative to the parent order will be permanent and will not depend on the market changes. The possibility of setting the order rate as increment not only releases you from the necessity of counting the exact execution rate of the orders but also allows for the automatic correction of the linked orders when there are changes in the rate of the parent order. One more fundamental difference of the TradeRoom from the similar trade platforms is that you can place the order rate not just close to the market (to the current rate) but even at one point distance. In the most competing trade platforms, it is not allowed to activate the orders with the rate which differs from the current rate less than 5-10 points, and the limitation "not closer than 15-20 points" is a common thing. This TradeRoom feature allows a successful trading in the conditions of a fast market rate change when it is hard to make a deal manually, while you press "Buy" or "Sell" since the quote changes rapidly for a short period of time. In this case, it is suitable to use the orders rate as increments for opening/closing a position. Let us have a look how it works. Create an order with the rate specified as "=+1". 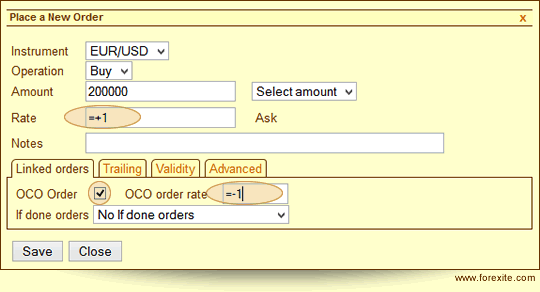 Check the "OCO Order" option in the "Linked orders", the rate "=-1" will be set into the "OCO order rate" automatically. After you press "Save", two OCO orders will be placed. The first order will be with the rate 1 point up from the market rate, and the second one will be 1 point down. If the EUR/USD market rate changes, one of the linked orders will be executed and another one will be cancelled. Neither fast changes in quotes, nor a low internet connection influence this method, which always allows you to open/close a position. 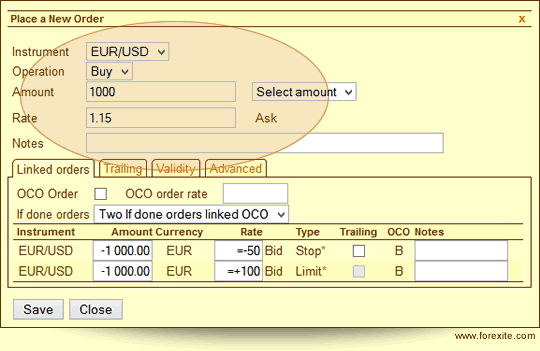 Control of the other orders (for an OCO order cancellation or an If-Done order activation). Receipt of messages about certain events in the Forex market. 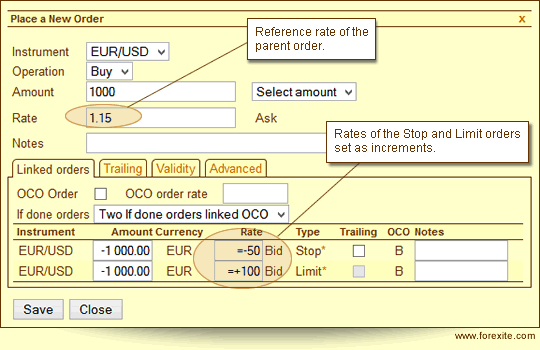 The above picture shows how to place a zero-amount order for the EUR/USD instrument. The purpose of the order is to catch the point when the EUR buying rate becomes equal to 1.6 USD. As soon as the order is executed, the system automatically sends the message to your email address. Mobile network operators can provide you with receiving SMS from E-mail service (E-mail2SMS). Therefore, it is possible to set the receiving of the orders execution notifications to your mobile phone. You do not have to constantly sit at the computer and follow the quote changes. Event notifications receiving can be changed on the "Notifications" page of the system preferences. Trailing order (also called a tracking order) is a Stop order the rate of which automatically changes so that the difference between the order rate and the market one does not exceed the specified value called a trailing distance. After setting the trailing order the system acts as follows: in case the market rate moves away from the order, the order rate automatically shifts following the market one. If the market rate moves towards the order, the order rate is not changed. The TradeRoom system employs a discrete trailing – the order rate is changed only after the market rate changes by a certain value called a trailing step. The distance and step of the trailing are set in the order editing form in the "Trailing" tab. 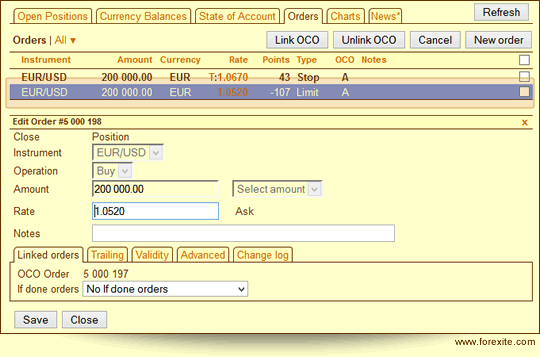 The trailing order can be used not only to close a position, but also to open a new position. 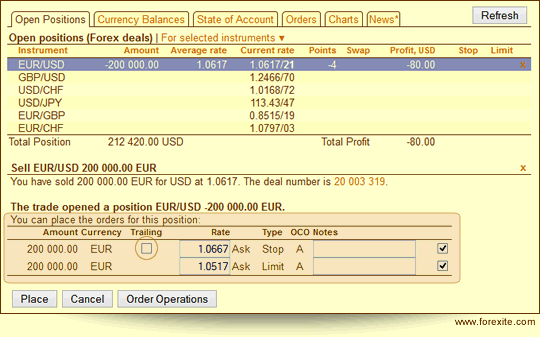 Since the orders allow for zero amounts, the trailing orders can be used for reporting of changes in the Forex market. Thus, a skillful work with the orders can simplify your life, allow you to automate a number of trading operations without a permanently staying by the computer.